Friends: As I prepare for our next cancer event in Santa Barbara on November, 2, 2018, I need your input and suggestions, not your treasures. I recall the Mrs. Fields experience years ago. She developed a cookie that we all wanted to make; we wanted the recipe! There are different variations in recipes for cookies; all good, some better, Mrs. Fields was the star! I want your input so we can make our movement the best it can be. 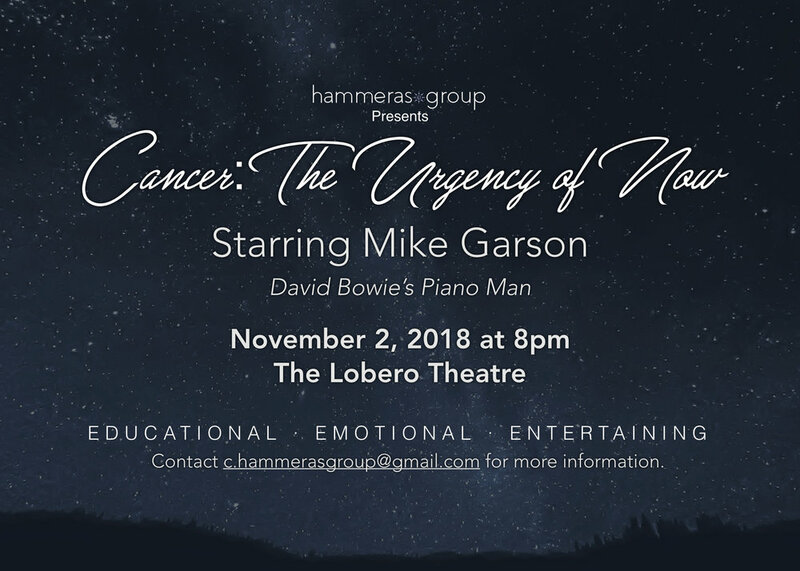 The cancer concerts are my way to educate the public and encourage the international healthcare community to work together, to share their analyzed data, to collaborate for cures! We have thousands of foundations in the world raising funds for their research. We have thousands of research facilities and researchers working hard for cures but they are not connected. The dots are not connected! Our progress in finding cures lies in sharing our best recipes together, not working in thousands of separate kitchens. At this point in my career, I am certain my role in life is to connect those dots and it is often not possible because there are too many recipes. As a healthcare advocate specializing in cancer, I have seen too many lives lost to cancer. It is a story that is repeated daily affecting children and adults. A story whose ending I want to help change! Through the generosity of caring and influential people, our cancer concerts are a gift to each community. We are not a foundation, nor a business, but an international movement of awareness and education. We do not request donations. We use the incredible gift of music from the renowned Mike Garson and special guests to lighten a difficult subject. We offer a spectacular evening and the event in Santa Barbara will absolutely not disappoint. What I am requesting from you is to begin to spread the word about this "collaborate for cures" movement; it is urgent! The more people who become better educated, the faster we can make progress and lives can be saved. My website is listed as a free resource with tools to guide patients who are newly diagnosed as well as discussing critical advances in collaboration. The concert in Santa Barbara will have many surprises that I will add as we get closer, please share with your friends and follow our progress! If you have suggestions on how to grow this movement, please reach out. Our contact information can be found at the top right of the website under Contact. We have to do this together and Santa Barbara is our next stop! Older PostClinical Trials: When Is the Right Time?